On Thursday, October 22nd, 2009, many of the World’s top battle DJs, turntablists and party rockers will gather on the wheels of steel at BB King Blues Club 237 West 42nd St in Times Square, New York City to celebrate the life and legacy of the late Grand Master Roc Raida! 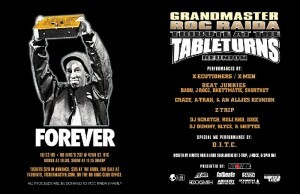 The Grand Master Roc Raida Tribute at the Tableturns Reunion will bring together many of the biggest names and crews in the art form of Turntablism including Raida’s fellow crew members from the X-Men and the X-ecutioners; fellow World DJ battle champions: Craze, A-Trak, Dubspot’s DJ Shiftee plus DJ Scratch, DJ Dummy, DJ I-Dee, The Beat Junkies: Babu, J.Rocc, Shortkut and Rhettmatic; DJ Slyce, Roli Rho, DJ Z-Trip and a very special performance by MC legends: D.I.T.C.! Tickets are $20 in advance at Fat Beats NYC, the BB King Box Office, and through Ticketmaster, $25 at the door. Doors open at 10:30pm. The show begins at 11:15pm! 100% of the show’s proceeds will go to his wife and children. Tableturns, founded by Doug “Sugarcuts” Cohen, was the World’s first open turntable event. It occurred monthly from March, 1997 through March, 1999 at the Nuyorican Poets Cafe in New York City. Not only did it markedly boost the skill level of DJs across the tri-state area, it became an institution! Since Roc Raida‘s unexpected passing on Sept. 19th, 2009, at the peak of his career (the 1995 DMC World Champion was DJing for Busta Rhymes) famous friends across the world have organized fundraiser/tributes for his wife and children. The outpouring of sympathy and love has been tremendous! The event on Oct. 22nd will be followed by another star studded fundraiser in NYC on Nov. 25th at Nokia Theater (more info tba). His wife and daughters have also announced that they will continue the very special DJ battle that he created and organized since 2006: Roc Raida’s Gong DJ Battle! Friends who wish to organize a tribute/fundraiser should respectfully seek permission first, from his family, by writing to roc4raida@gmail.com. Friends who want to make a donation can log on to paypal.com and direct funds to the address: ladietye@yahoo.com. Please support a fundraiser near you and stay posted to myspace.com/rocraida for any and all official information released by his family.